Check back soon for more testimonials! I have been buying insurance through Demetriou Insurance for years. Insurance, like any other product, can probably be found "cheaper" somewhere. Those cheaper products have a very short life span. I am old fashion, I like and need security and assurance. Kathy and Ted are so far ahead of the pack in the area of "customer service" ,"support" and "assurance" that I would not consider doing business with any other company! Their example of customer service as well as terrific insurance services cannot be beat and should be used as a business model in any company. “I’ve had a 20 year working relationship with Ted and his staff. He is a loyal advocate for his clients and works tirelessly to meet their insurance needs. I consider him to be one of the most honest, ethical and hard working professionals in the industry. Without question or hesitation I give him my highest recommendation. 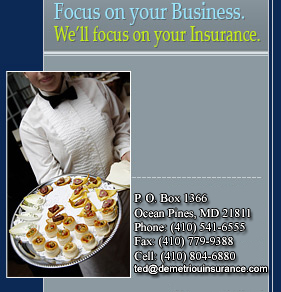 Demetriou Insurance Services has been providing the insurance needs for me and my family for the past 23 years. During this time Ted and his team has kept us ahead of the curve. The right insurance coverage and for the right premium. Now my children are signing up with Demetriou. Thank you for your hard work and a special thanks to Kathleen Hykes, she always has her A game on.